90% of hip dislocations are posterior; 10% percent are anterior. Typically, an AP pelvic radiograph is adequate to diagnose a hip dislocation. Judet views are help­ful in diagnosing associated fractures. Traumatic dislocations of the native hip should be reduced within 6 hours to reduce the risk of avascular necrosis and posttraumatic arthritis. Lower-extremity dislocations are less common in the emergency department (ED) than shoulder and elbow dislocations, and emergency clinicians’ experience with evaluation and reduction techniques is often limited. Nonetheless, these dislocations can be serious because of their association with vascular injury. This episode discusses the mechanism of injury, diagnostic approach, treatment plans, and potential complications of dislocations of the hip, knee, and ankle. This episode of EB Medicine’s EMplify podcast is hosted by Jeff Nusbaum, MD, and Nachi Gupta, MD, PhD. This month’s corresponding full-length journal issue of Emergency Medicine Practice was authored by Dr. Caylyne Arnold, Dr. Zane Fayos, Dr. David Bruner, and Dr. Dylan Arnold. It was peer reviewed by Dr. Melissa Leber and Dr. Christopher Tainter. The Bastion Classification criteria stratify explosion related lower limb injuries into 5 categories to guide treatment. The validation study of the Bastion Classification (Jacobs 2014) was not designed to correlate class of injury with outcomes such as mortality, transfusion requirements, or definitive amputation level. The Bastion Classification correlates better in blast injuries resulting in traumatic amputations than in segmental injuries. Because not all injuries involve complete traumatic amputation of a limb, this classification is supplemented by the suffix “S” to denote a segmental injury, defined as the presence of potentially viable tissue distal to the most proximal injury. Associated injuries to the intraperitoneal abdomen, genitalia and perineum, pelvic ring, and upper limbs are important in treatment and operative planning, so these are denoted by additional suffixes A through D, respectively. Prehospital application of a tourniquet can effectively obtain hemorrhage control. The study validating the Bastion Classification (Jacobs 2014) had 98 injuries requiring pneumatic tourniquets out of 179 injuries (55%). A recent study in 2017 by Scerbo et al reported that patients who presented without prehospital tourniquets received more transfusions in the first hour of arrival (55% vs. 34%, P = .02) and had increased mortality from hemorrhagic shock (14% vs. 3%, P = .01). The Bastion Classification was developed as a classification system to comprehensively describe the injury pattern of lower extremities after blast injuries. It correlates with treatment need, such as the requirement for operative proximal vascular control or amputation level. The criteria are helpful for facilitating communication between clinicians and for operative management. 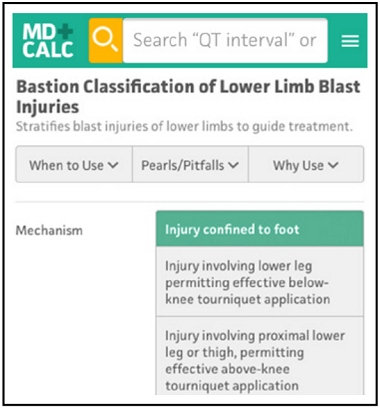 Use the Bastion Classification for patients with lower extremity injuries after explosions resulting in complex blast wounds. The constellation of injuries may include blunt or crush injuries, traumatic amputations, and compartment syndrome, as well as associated neurologic, thoracic, gastrointestinal, and genitourinary injuries. Management depends on the injuries diagnosed. Using the Bastion Classification and its suffixes, emergency department physicians and trauma surgeons can anticipate the need for other surgical consultations and the resources required for treatment. A panel of military surgeons, Jacobs et al, developed the Bastion Classification and performed a prospective validation study with 103 patients who sustained 179 lower limb injuries caused by improvised explosive devices treated at Camp Bastion, Afghanistan, from November 2010 to February 2011. The primary aim of the proposed classification was to provide a pragmatic, comprehensive, and clinically relevant system to better facilitate the transfer of information. Currently existing lower limb injury classification systems fail to describe the complete injury pattern or correlate with management. The Internal Committee of the Red Cross classification is broad and does not provide information on the severity of injury. The Mangled Extremity Severity Score (MESS), Gustilo and Anderson, and Müller AO classifications do not provide information on injury level. The Müller AO classification also does not take into account soft tissue injury. The secondary aim of the study by Jacobs et al was to facilitate the assessment of interventions. The Bastion Classification did show a predictable association with the level of initial musculoskeletal debridement and/or amputation and the level of vascular control. The original study was not designed to correlate class of injury with outcomes such as mortality, transfusion requirements, or definitive amputation level, and thus, this information is not provided in the publication nor in the conclusions made. A study in 2013 by Lundy and Hobbs looked at 67 patients with 117 injured limbs caused by dismounted blast exposure. The authors noted that the Bastion Classification appeared to be predictive of initial musculoskeletal treatment but was less useful in predicting the need for proximal vascular control, especially in the most common Class 3 injuries. The original study by Jacobs et al showed that Class 3 injuries correlated with a higher rate of intra- or extraperitoneal iliac vessel control (23% of 83 Class 3 injured limbs without associated abdominal injuries) compared to the study by Lundy et al that only had 1 patient with a Class 3 injury without associated abdominal injury and 6 (5%) of all injured limbs requiring iliac vessel control. The 2013 study does not comment on correlation of the Bastion Classification to mortality rates. Jacobs N, Rourke K, Rutherford J, et al. Lower limb injuries caused by improvised explosive devices: proposed ‘Bastion Classification’ and prospective validation. Injury. 2014;45(9):1422-1428. Lundy JB, Hobbs CM. Bastion Classification’: evolution of experience mandates caution when considering using class as predictor for method of temporary vascular control. Injury. 2013;44(11):1671-1672. Scerbo MH, Holcomb JB, Taub E, et al. The trauma center is too late: major limb trauma without a pre-hospital tourniquet has increased death from hemorrhagic shock. J Trauma Acute Care Surg. 2017;83(6):1165-1172. Cannon JW, Hofmann LJ, Glasgow SC, et al. Dismounted complex blast injuries: a comprehensive review of the modern combat experience. J Am Coll Surg. 2016;223(4):652-664.e8. Coupland RM, Korver A. Injuries from antipersonnel mines: the experience of the International Committee of the Red Cross. BMJ. 1991;303(6816):15909-15912. Gustilo RB, Mendoza RM, Williams DN. Problems in the management of type III (severe) open fractures: a new classification of type III open fractures. J Trauma. 1984;24(8):742- 746. Müller ME, Nazarian S, Koch P. The Comprehensive Classification of Fractures of Long Bones. Berlin: Springe Verlag;1987. Brown KV, Ramasamy A, McLeod J, et al. Predicting the need for early amputation in ballistic mangled extremity injuries. J Trauma. 2009;66(4 Suppl):S93-97; discussion S97-98. Assess different types of lower-extremity joint dislocations based on physical examination and radiographic studies. Choose the most appropriate methods for reduction of dislocation, based on staff resources and patient needs. Describe the circumstances when it is necessary to obtain specialist consultation for a lower-extremity dislocation. Date of Original Release: December 1, 2017. Date of most recent review: November 10, 2017. Termination date: December 1, 2020. Faculty Disclosure: It is the policy of EB Medicine to ensure objectivity, balance, independence, transparency, and scientific rigor in all CME-sponsored educational activities. All faculty participating in the planning or implementation of a sponsored activity are expected to disclose to the audience any relevant financial relationships and to assist in resolving any conflict of interest that may arise from the relationship. In compliance with all ACCME Essentials, Standards, and Guidelines, all faculty for this CME activity were asked to complete a full disclosure statement. The information received is as follows: Dr. Arnold, Dr. Fayos, Dr. Bruner, Dr. Arnold, Dr. Leber, Dr. Tainter, Dr. Mishler, Dr. Toscano, and their related parties report no significant financial interest or other relationship with the manufacturer(s) of any commercial product(s) discussed in this educational presentation. Dr. Jagoda made the following disclosures: Consultant, Daiichi Sankyo Inc; Consultant, Pfizer Inc; Consultant, Banyan Biomarkers Inc; Consulting fees, EB Medicine.